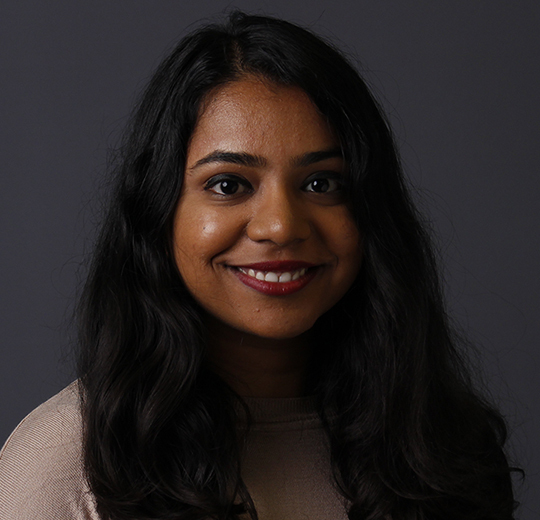 Supraja Narayanaswamy joined Turnaround for Children in 2018 as Senior Data Manager on the Organizational Learning and Impact team. In this role, she works to ensure that research and data inform all program functions at Turnaround and are used to continuously improve Turnaround’s tools, services and impact. Prior to joining Turnaround, Supraja was a Research Associate at Chrysalis, an education innovation organization in India aimed at mobilizing school and policy partners to enable a curricular reform targeted at developing the whole child in the Indian education system. For three years, she led the Chennai city chapter of Becoming I Foundation, a nonprofit aimed at providing support and services to improve equity in educational opportunity and achievement in underserved schools and communities in urban India. Supraja also has experience working in corporate social responsibility in several sectors such as health, education, water and sanitation. Supraja earned an M.Ed. in international education policy from the Harvard Graduate School of Education. She also holds a B.A. in economics from Stella Maris College in Chennai, a coastal city in the south of India, where she is originally from. Who do you admire most in your life — who is your hero? The person I admired the most was my great-aunt who I had the fortune of growing up around. A tireless educator, the family breadwinner, and a self-made, independent woman, she was my teacher and inspiration. She taught me to be curious about the world, to think of the right questions, and to not shy away from asking or answering them. I learned from her how different “schooling” and “learning” were in India, and have since been inspired to bridge the gap between the two. What book has inspired you most? Tuesdays with Morrie is one of my all-time favorite reads. It’s a simple, honest, true story about the philosophy of life, death and all things in between as portrayed through conversations between a teacher and his student. I take back valuable lessons for both my personal and professional lives.